Have you ever “Time Traveled” on your dirt bike? Riding along, and all of a sudden it hits you; “I’ve been here before”. Like déjà vu all over again. How about a 25 year Time Travel? At Tomahawk’s Phil Bean Memorial Trail Tour last June 26th and 27th, some of the Dual Sport Route that Jeramey, Shannon and the rest of the G. L. Dual Sporters laid out started to look very familiar. Not like, “I rode it last season” familiar, but, “a long time ago, like a lifetime ago” familiar. We were running old two-tracks, forest roads, wide trails and with so much private land in the area, the inevitable road sections. Popping in and out of the woods, occasionally getting magnificent views of the surrounding hills, valleys and highlands, “Michigan Mountains” I like to call them. Any downside to popping out on the road sections in that area, to get around private property was greatly out-weighed by the fantastic views. Guilty of “Daydreaming While Riding”? Maybe I was, but it’s tough to concentrate on riding while checking out the sights! We came off a two-track, turned on to this desolate, little-used piece of dirt road, then it hit me; this is old relocated MCCCT that we had been following! Part of the original Pere Marquette Cycle Trail that Phil Bean, Ed Graham and Mel Lill originally scouted and led crews through, hanging ribbon and triangles with nothing better than county maps and compasses. Now, 30 years later, we are back enjoying it again. 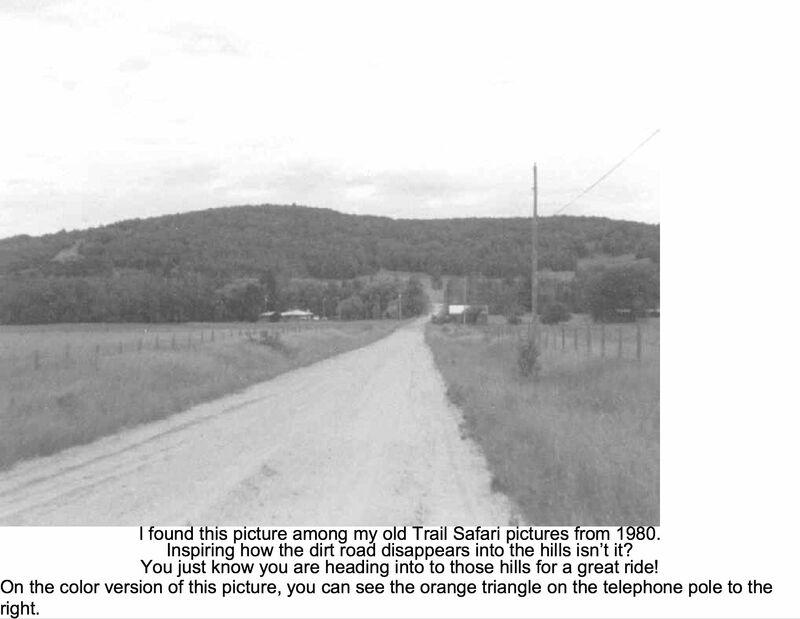 This is the same Trail Safari/MCCCT stuff my brother and I rode in 1980 when we were just puppies on 175 DT Yamaha and 250 CR Honda two-strokes. When we popped out from that certain two-track onto that dirt road and got that great view, it all came back like it was yesterday. In June of 1980, my brother and I were dropped off at White Cloud with our tents and sleeping bags bungied to our rear fenders. I had a trick tank bag with a clear map holder for the 16 page CCC mapbook and a crescent wrench hose-clamped to the swing arm, with it’s jaws cinched down on the axle nut. Riding gear? Yah right. $60 mail-order “enduro” boots and the coolest lamb skin Hi-Point red, white, and blue gloves (try to find some of those today, and for $22!) were the highlight of my wardrobe. A $10 open-faced helmet for my $10 head, Scott goggles (with the clip-on facemask of course), and our high-tech-trick riding outfits supplied from Levi Straus. Jeans (yes, they were bell-bottoms) and jean jackets, the standard 1970’s enduro pants and jacket combo. We got lucky in 1980, the rain held off all week, (rain gear? see: “Levi” above), we didn’t ever crash hard (first-aid kits? Are you kidding? Six Band-Aids! ), no break-downs, (we didn’t have very many tools to fix anything with anyway!) and for the life of me, how we ever found our way through those woods with very few triangles and no GPS, I will never know. 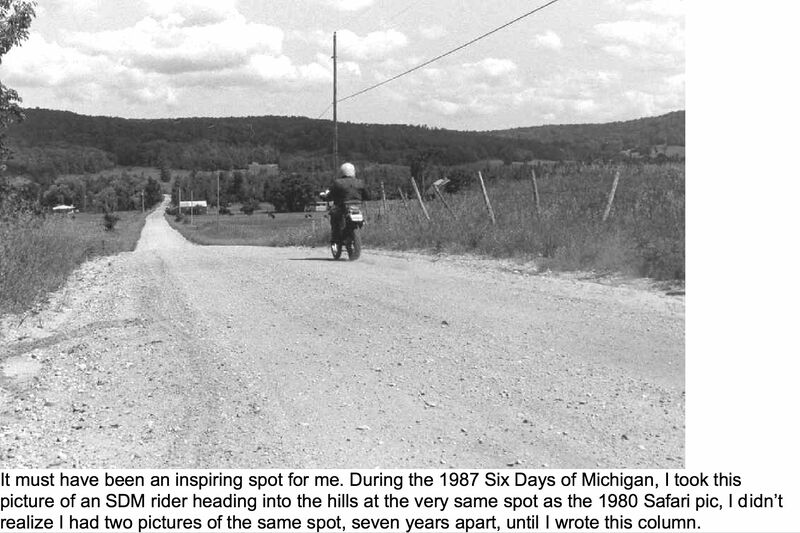 We were two days into our 1980 Trail Safari adventure when we rode into these “Michigan Mountains”, riding some of these very same trails we rode this past June. That’s when I went on my little “Time Travel”. The G.L. Dual Sporter’s Route took me on it. Riding through those hills brought back that Trail Safari I rode with my brother in 1980. Here I was, 24 years later, riding behind my brother again, on some of those very same trails. I was in a Zone. A Trippy, Time-Travel Twilight Zone. I want to thank Jeramey Valley, Shannon Ruthrauff and the rest of the Great Lakes Dual Sporters for taking me on my little time-travel trip. You brought back a lot of good memories and inspired us into breaking out that old 16-page mapbook. We’re going to try to follow what’s still legal of our 1980 route next year and try to re-create that twenty-five year old Safari ride. Except, twenty-five years later, we’ll have GPS, Goretex, money for motels, bunsavers and 600cc four strokes. Hey, I said we wanted to re-create the RIDE, not the SUFFERING!! !